In my life, there have been a number of tragic, momentous occasions such as the Space Shuttle Challenger disaster or the Space Shuttle Columbia disaster, which are burned in my mind. 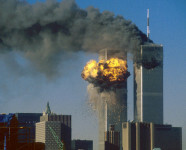 However, the events of 9/11 trump all of this simply because this was the modern day equivalent of the attack on Pearl Harbor, only instead of a foreign nation using military assets to attack the United States, Muslim terrorists used our own commercial planes as weapons attack us and attempt to bring us down as a nation. As such, I thought I’d reflect on how that day was for me now that ten years have passed. For me, the day was a normal work day when I awoke that Tuesday morning. I had a great job that paid me a ton of money on top of the perks. Heck, I was even planning a trip back to Japan to see my old stomping grounds the following year. Life was pretty good. As was my normal routine, I woke up at 06:300MT as I normally did back then and turned on the TV to the news so that I’d have a rundown of what was happening in the world as I got dressed. I got into the shower and took my time. When I got out and had dried off, I could hear the announcer stating that a plane had crashed into the World Trade Center. I paused to look at the TV and the smoke rising before heading into my spacious, walk-in closet. I wondered what possibly could have happened to have caused a plane to crash into a skyscraper like that. While I was in the closet, I heard the announcer say that they had just witnessed another plane crash into the other tower. I ran out of the closet to look at the TV, seeing the new plume of smoke rising. My first thought was, “This was no accident” and I found myself annoyed at the news guy who was reminding folks that there was not any evidence as yet that there was terrorism involved. OK, technically, that may have been true but in my mind, there was no doubt that this was terrorism and the work of Muslims who want to advance their ideal world where Islam is the only religion and the world is one big Caliphate. It was a struggle to finish getting ready for work and I had to drag myself away from the TV and get out the door so I could drive the ~30-minutes(give or take, depending on traffic) to the light rail station for a 10-minute ride to downtown Denver. I immediately turned on the local news radio station and they were reporting that another plane had crashed into the Pentagon. I was horrified as I drove in, listening to the non-stop coverage of three planes that had crashed, not only killing the folks in the planes, but killing unknown numbers of folks in the buildings they crashed into. That horror grew as the news broke that the first Trade Tower had collapsed. Whereas previous attempts to bring down the World Trade Center towers had resulted in criminal trials, I knew that this attempt would mean war, plain and simple. The train ride to downtown Denver seemed longer than normal to me, mainly because everyone was talking about the plane crashed and the destruction of one of the Twin Towers. Rumors were everywhere with one rumor saying that all major cities with skyscrapers would be targeted. That didn’t bode well for me since I was heading for a 42-story building, where I worked on the 41st floor. Finally arriving at my destination, I decided that it might be a good idea to go ahead and pick up breakfast on the way in since my colleagues and I would likely be glued to the Internet looking for news. When I made it up to the 41st floor, no one was working and everyone was talking about what was going on. It was then that I learned that the second tower had gone down. Rumors were that the Air Force had shot down another plane but that there were more heading to different destinations. No one knew if Denver was on the target list. Naturally, getting anything from the Internet proved to be mostly hopeless as all of the major news websites had crashed. Our local news radio station’s website was also down if I recall correctly, and I think they were doing audio streaming in 2001. I remember CNN’s website was changed to something pretty low-key to better handle the traffic but provided only very basic information and was slower than molasses to access. I remember saying a prayer for those who’d lost loved ones as a new rumor mill hit our tower — a jumbo jet was in route to downtown Denver but no one was sure which building was the target. We all started putting our stuff together when our second line manager sent out an e-mail telling everyone to stay put and to get to work. If there was a problem, we would be told of it and then at that point, we could leave. This e-mail provokes a lot of anger, myself included, as our department and the departments that supported us (developers, DBA’s, system admins, etc.) all had the ability to work from home. As such, we all decided that we were going home and the 2nd line could fire us if he didn’t like it. After all, our lives were worth more than this job, no matter how well paying it was. Waiting for the train to take me back to the Park-and-Ride put me into a further foul mood and I regretted not going ahead and driving in all the way and spending the $15 to park (my train pass was a benefit from my company). It was a relief when I finally got to my car and could turn on the news, but I was eager to get home and actually watch what was transpiring. One thing the radio did was clear up some of the rumors we’d been hearing and made me think that maybe the worst was over. When I got back to my apartment, I immediately flicked on the TV to see the live broadcast before sitting down at my desk to connect my PC to my job’s network and sign onto everything like normal. I checked my e-mail and couldn’t help but laugh as we had a new e-mail from our second line which informed us that we could work from home. The rest of the day is kind of a blur to me. While I was logged into the network to be able to do work, I only did those absolutely essential items required of me and spent the rest of the time glued to the TV. As a former military member, I thought about those whom I was sure would be sent into combat and hoped that we would unleash the “wrath of God” upon those who’d dared do such a thing to us, thus hopefully getting things over quickly with the least amount of casualties for us. Now that ten years have passed, it saddens me to remember that for a few days following the attacks back then, it didn’t matter if you were liberal or conservative, we were going to make these Islamic bastards pay for what they’d done. It sickens me to know that it didn’t take long for the politics of things to rear their ugly head to where now, we have elected officials who’d rather play politically correct games for fear of the media or for fear of being branded an Islamophobe. It frustrates me to know that as a nation, we’ve had problems with Middle Eastern militant Muslims since shortly after our country was founded. The Islamic Barbary Pirates forced the United States to pay MASSIVE amounts of tribute, resulting in our nation creating a new navy in 1794 to protect ourselves. The demands for tribute continued, so in 1801, President Jefferson refused to pay any more tribute and the First Barbary War started, lasting until 1805. We won but the War of 1812 against Great Britain saw the return of Muslim pirates attacking and plundering U.S. ships. In 1815, the Islamic Regency of Algiers declared war on the U.S. for not paying required tribute. The U.S. responded by sending a large naval force to the area and after a brief conflict, we forced Algiers to back down. After the fall of the Ottoman Empire, for a time, Islamic nations didn’t seem much of a threat to us. The British took control over what is now known as Israel and Jordan, both being part of the Mandate of Palestine. As I understand it, the British then used the Jordan river as a border to create the Mandate of Transjordan, which was designated for Arabs and Muslims while the now MUCH smaller Mandate of Palestine section would be for Jewish immigrants. Transjordan became an independent country (Jordan) in 1946 and Israel was made a country in 1948, leading to numerous wars and conflicts between Islamic nations and the Jewish state. However, from the standpoint of the U.S., these were simply middle eastern conflicts and nothing much to do with us directly. In the 1970’s, all that began to change with the Islamic revival, where the Arab Oil Embargo was the first flexing of Islamic power. That escalated with the Iranian Revolution where the Shah of Iran was deposed and for a very short time, a government that was non-theocratical was created. That ended with the take over of the U.S. Embassy in Iran in 1979 and the resignation of said interim Iranian government. From then on, Islamic revolutionaries all over looked for ways to attack the U.S., whether it be by hijacking planes, planting bombs on warships, planting bombs in buildings, or doing “whatever” to fight us. Throughout all this, our country never really took the threat seriously (in my opinion) and sadly, despite the events of 9/11, it seems that we still don’t really take the threats that seriously, other than to put ourselves out lest we be seen as Islamophobic. *_* We fight two wars but in both, we still held back out of political fear rather than getting the job done and getting the heck out of Dodge. I fear that the result of this will be bad juju when we finally do pull out of Iraq and Afghanistan. So, this 9/11, I will remember those who have died in the long-running war between militant Islam, who would see the entire world converted to Islam or die, and the United States. I hope that one day, our nation will take the threat seriously, beyond extra screening of old folks and the like at airports, and that an ultimate victory, such as we had against Japan and Germany in World War II, would result in peaceful relations between Islamic states and the United States. Such is the dream. Somehow, given how weak and self-involved our political ruling elite in Washington are, we’ll be in conflict with militant Islam for the rest of our lives. Too bad the leadership of 1801 and 1815 doesn’t exist today. This entry was posted in Uncategorized and tagged reflection on September 11, 2011 by AstroNerdBoy.